I would like to have a Caricature with background and body, in colour marker with theme. It's going to be my Valentine's gift. 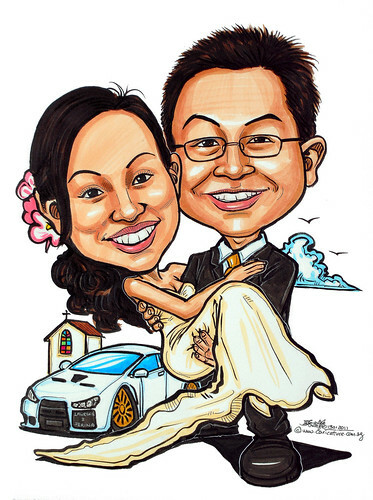 The theme is a Wedding like this couple in http://www.flickr.com/photos/caricature/4847967981/ with our car and a church/chapel, and the square number plate with "Lawrence & Serina"
For reference: Attached is a picture of me. Attached is the car, an evo X. Perhaps in A2 size landscape to fit the car and the church as background with A2 size frame (without border)? ...."